Franklin County Visitors Bureau highlights a holiday visit to Greencastle's Heritage Christmas. 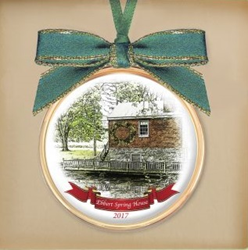 2017 Greencastle Holiday Ornament highlights history at Ebbert Springs. It is three consecutive Fridays of family fun in Greencastle PA. The Franklin County Visitors Bureau invites visitors to holiday fun at Greencastle’s Heritage Christmas, December 1, 8, and 15, 5:30 PM to 8:30 PM. Each Friday includes horse and carriage rides through downtown, cookie decorating, luminaries, carolers, holiday window displays, and a variety of music on the square. Enjoy a holiday train display at the 1909 Highline Train Station on South Jefferson Street. Children can bring their Letters to Santa to post in the special mailbox on the square. It is three consecutive Fridays of family fun in Greencastle PA.
On the first Friday of Heritage Christmas, December 1, Allison Antrim Museum is holding a Christmas open house from 6:30 PM to 8:30 PM. The 1860 museum house, situated on the original land tract owned by town founder John Allison, is decorated as a Civil War era home. Della Robbia fruit arrangements in the Victorian concrete urns and transom of the front door welcomes guests. Roping on the banister, fresh magnolia and boxwood greens, and cedar tree decorated with dried fruit, gilded walnuts, Marzipan fruit candies, gingerbread cookies, antique candle holders, and Civil War flags will take visitors back to a much simpler time. Vintage toys, period furnishings, and an 1800s one-horse sleigh are on display throughout the museum house. In the German Bank Barn, enjoy the display of 1930s vintage boyhood toys. Susan Shaffer, of Joyful Arts Studio in downtown Greencastle, will lead guests during a come-and-go evening of painting a take-home Christmas ornament. Reservations can be made here or by calling 717- 658-2177. Residents of the Greencastle area hold an annual “Light It Up” decorating contest. Visitors can enjoy the twinkling handiwork of local residents as Greencastle and the surrounding Antrim Township sparkle for the holidays. Be part of selecting the winner by casting a $1 vote from December 8 to 18. Proceeds benefit the Greencastle Food Pantry. A visit to Greencastle is just one of many ways to explore Franklin County PA. The Franklin County Visitors Bureau invites all to explore history, arts and architecture, recreation, natural beauty, fresh foods and the warm hospitality of communities like Chambersburg, Greencastle, Mercersburg, Shippensburg, and Waynesboro. Franklin County PA is located just north of the Mason Dixon Line and is an easy drive to Washington DC, Philadelphia, and Pittsburgh. Discover more…. plan a visit soon at ExploreFranklinCountyPA.com or by contacting 866.646.8060.